In first step we need to draw skeleton of the character, we call it “stickman”. After that we sketch the line of the neck and spine. Don’t forget that length of which is equal to the height of the three heads. On the line of the spine sketch out a wide thorax and a narrow pelvis. Note that the thorax in width is equal to the width of two heads. With the help of simple lines sketch out the arms and legs. So, we can see that the body of tall athletic man is about the height of eight heads. In this step we need to give volume of each part of the body . We advise you to draw from the top down. The drawing in this direction will be really easy you because Spawn here is standing straight. First draw the lines of the facial symmetry, which will help us to draw facial features. Connect the chest and pelvis – waist should be enough narrow. Draw the shoulders, elbows and knees using circles. 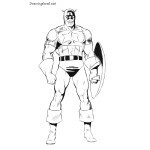 Draw arms and legs using modified cylindrical shapes. In the same step give hands and feet more right form. 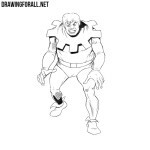 In this step we will add some basic details to the drawing. Let’s start with the head, sketching the eyes, nose and mouth with light lines. 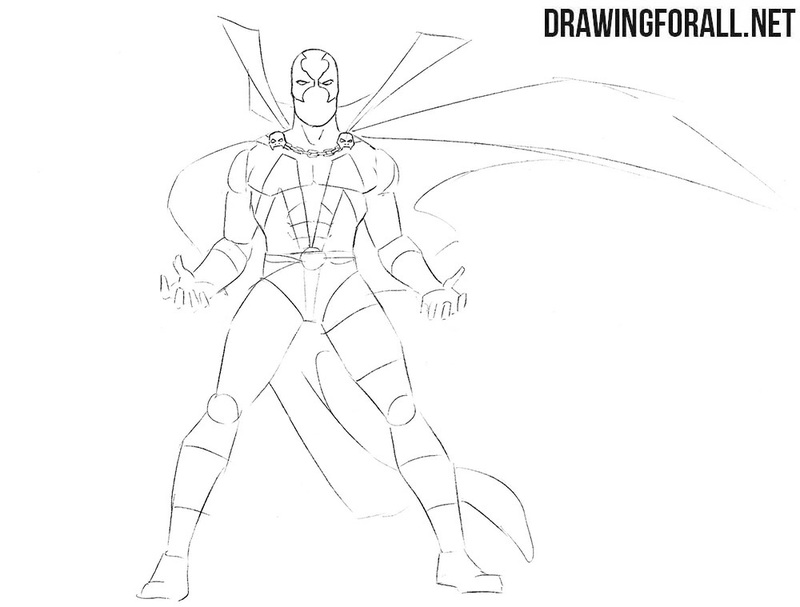 Next, sketch out the outlines of the mask and high collar. Sketch out the long cape and lines of the costume details. 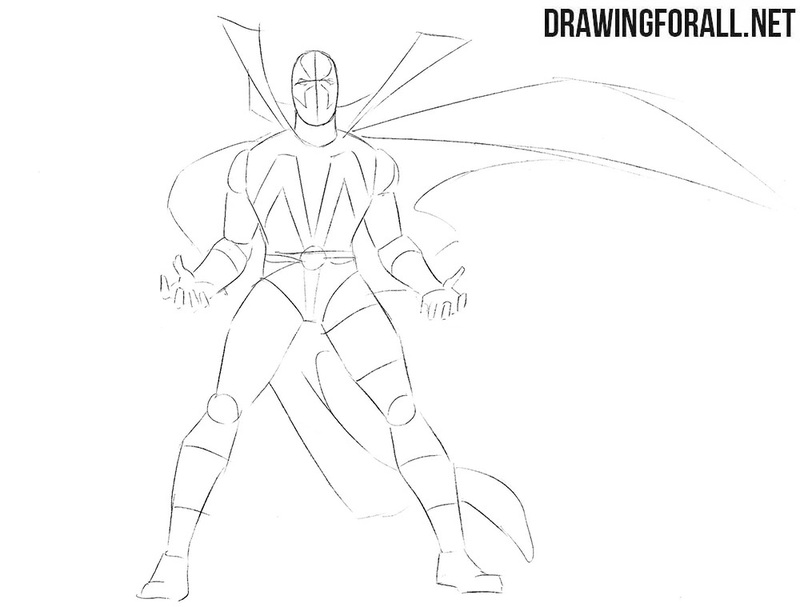 We continue to work on basic details.Now we will draw “M” word on the Spawn’s body. It will be very easy step. We draw the eyes on the mask and erase the extra guide lines from the second step. To this moment we finished the head. So we go to the body. We sketch out the lines of the muscles of the neck. 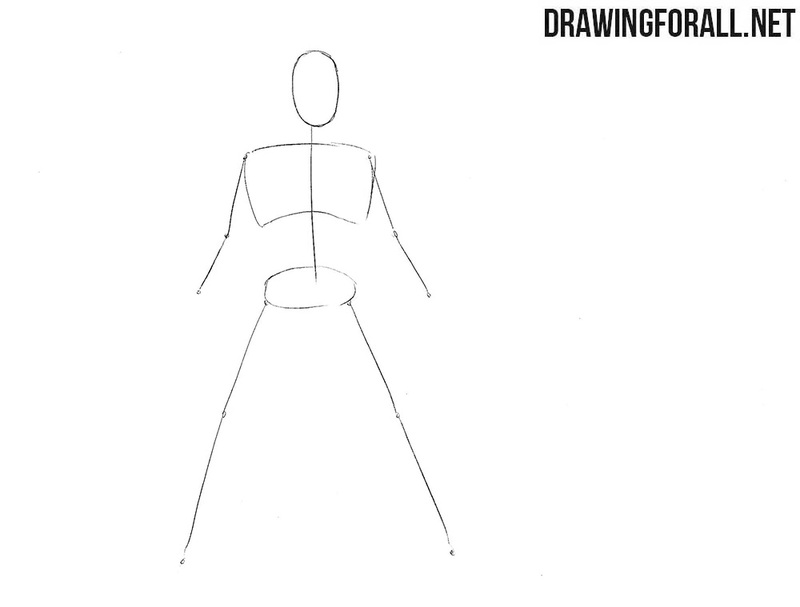 Erase the lines of the “spine” and circle the lines of the torso (if you have not done it in the last steps). 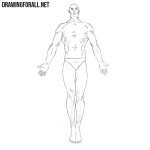 Draw the pectoral muscles and sketch the lines of the muscles of the abdominals. At the same step draw chain and craniums between the collarbones as you can see in the our example. It’s time to draw the arms of the our character. Draw the lines of muscles – deltoids, biceps, triceps. You can read stage 2 of this article to know where these parts of arm are located. After that, draw the portions of the gloves which are locetaed on the forearms. Draw the fingers and knuckles, as in our example.Using longitudinal lines draw patterns on the forearms and hands. Don’t forget to erase the guidelines after these actons. It wil make the drawing cleaner. 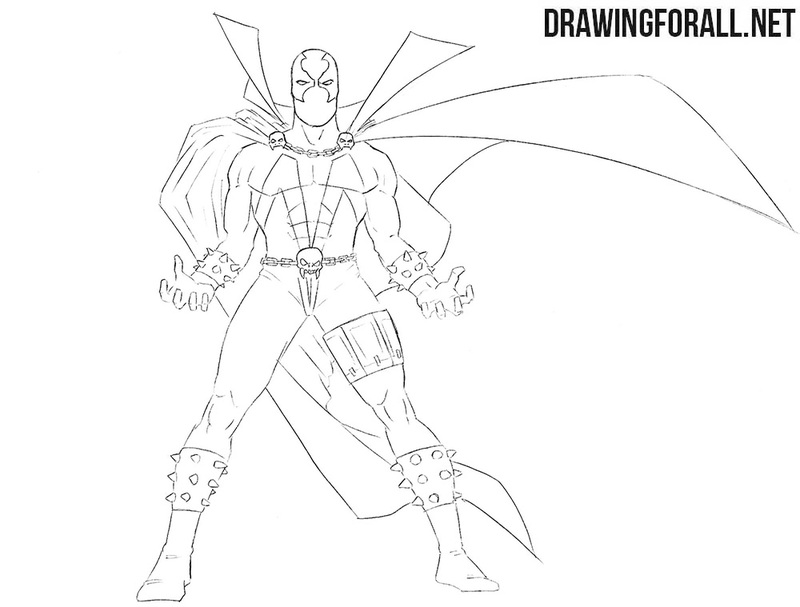 In this step, we draw the legs of Spawn. Erase the guidelines from the legs and draw some folds in the area of knees. Don’t forget to draw the lines of the muscles in the areas of thighs and shins. Using a couple of curved strokes draw the lines of the shoes. By the way, do not forget the folds on the boots in the area of the ankle. So we have a final step and we erase the guidelines. Also we circle the lines to make the lines smooth and clean, as you can see in the example. 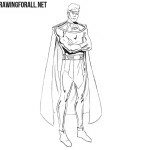 Add some folds to the left part of the cape. 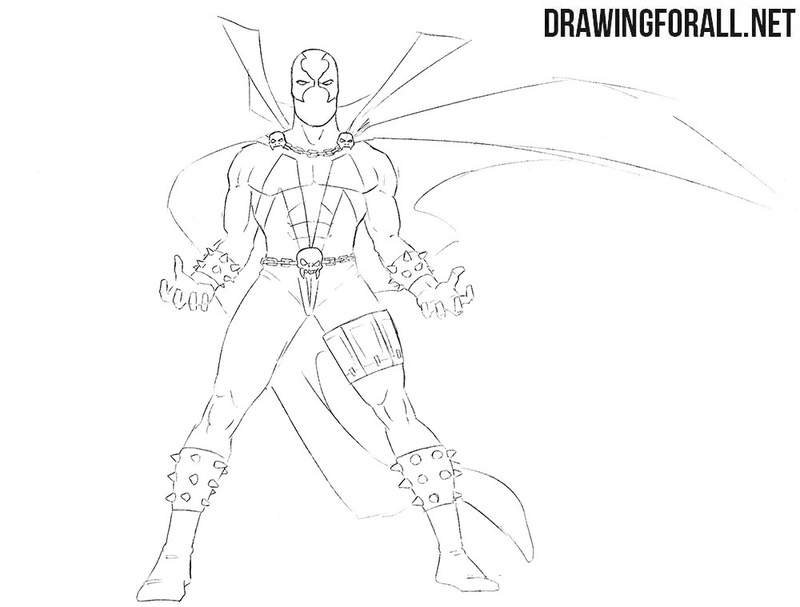 It was a lesson in which we told you about how to draw Spawn which was created by Drawingforall.net team. We really hope that this lesson was useful for you. If so, then do not forget to share it with your friends and subscribe to us on social networks.